The Combat Challenge Team for the Niagara Falls Fire Department was first established in 1999. Since its inception, several firefighters from both the full-time and volunteer ranks have participated as team members in various challenges in both Canada and the United States. 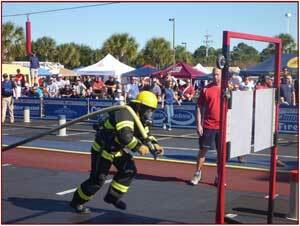 The Challenges encourage firefighter fitness and demonstrate the profession’s rigour to the public. Wearing full gear, competitors race head to head performing a series of tasks including tower climbing, hoisting, chopping, hose dragging and rescuing a weighted life-sized victim. In 2010, the Niagara Falls Combat Team attended the World Combat Challenge in South Carolina with successful results.